Ethical decision-making in finance is a decision-making ideology that is based on the underlying moral philosophy of right and wrong. 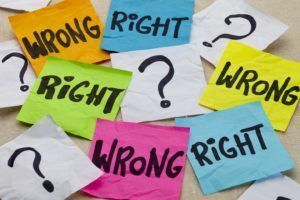 Ethical decision-making is normative in nature, and ethical decisions are not solely driven by the goal of profitProfitProfit is the value that remains after a company’s expenses have been paid and can be found on an income statement. Other terms include income and earnings maximization. An ethical decision is one that stems from some underlying system of ethicsBusiness EthicsTo keep it simple, business ethics are really the moral principles that act as guidelines for the way a business conducts itself and its transactions. In and moral philosophy. The ethical decision-making framework described in this article is not unique and is just one of many such frameworks. Is it a breach of trust? The company should act in a way that inspires trust and positively impacts its reputation. The company should act with integrity and honesty. The company should be reliable. The company should behave in a stable and consistent manner. The company should keep its promises and take its reputation seriously. The company should respect its customers. The company should respect its workers. The company should respect its competitors. The company should deal with disagreements and conflict in a respectful manner. The company should be tolerant of different beliefs and ideologies. The company should actively try to promote good moral behavior through its business decisions. The company should be considerate. The company is thoughtful and realizes that actions come with consequences. The company is disciplined and does not behave in a rash and erratic manner. The company accepts that it will not always get its way. The company takes success with humility. The company takes defeat with grace. The company is open-minded and does not react adversely to change. The company cares about its customers. The company cares about its workers. The company cares about its own reputation. The company cares about more than just profits. The company does not hold grudges and forgives easily. The company exhibits civic duty. The company treats its surroundings with care and respect. The company protects the local environmentCorporate Social Responsibility (CSR)Corporate social responsibility (CSR) refers to strategies that firms employ in their corporate governance that are ethical, societally friendly, and. The company recognizes its debt to the public. The company respects the law. The character-based decision-making model was developed by researchers at the Josephson Institute of Ethics. It provides a framework that can be used to decide whether a decision is morally and ethically sound. Ethical principles are morally superior to non-ethical principles and should be used as a guide for all decisions. The company should violate an ethical principle if it means it can promote a greater ethical principle. However, it is an extremely subtle rule and can be abused. In general, the company should make a decision that promotes the greatest amount of moral justness.